Wednesday, August 22, 2018 9:00 a.m.
Summary: This morning the Adams County Sheriff’s Office downgraded all fire evacuation notices from mile marker 181 north to the county line to Level 1 (Be Ready). Hillman Basin and Boulder Creek roads were downgraded to Level 2 (Be Set) status yesterday. The Idaho County Sheriff’s Office reduced evacuation notices for North Elk Lake Road, Lower Ranch Drive and High Meadow Lane to Phase 1 (Ready) status. Residents should continue to be ready to evacuate should conditions change. Yesterday, firefighters made good progress with direct suppression efforts on the White Bird Ridge north of Pollock Mountain and indirect suppression efforts on the southern perimeter of the fire. Today, moderate to active fire behavior is expected as temperatures increase and relative humidity levels drop. Firefighters continue to construct handline along White Bird Ridge to prevent movement into the Rapid River drainage. Firefighters will continue using heavy equipment to build fireline on the southern perimeter of the fire. 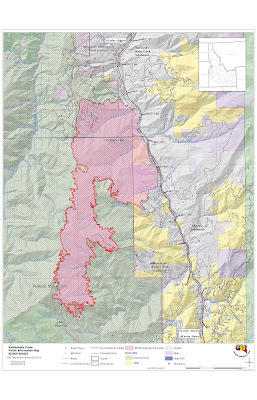 The most active part of the fire is near Chokecherry Flats on the southern end. Firefighters will continue to work in and around the Hillman Basin and Boulder Creek areas today. Air resources will assist with suppression efforts when needed. 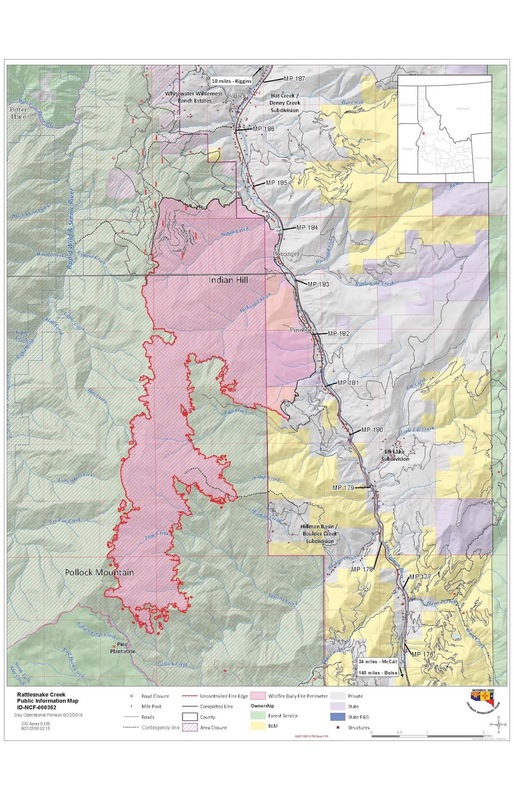 Resources Threatened: Private property and structures in the Pollock, Pinehurst, Hillman Basin and Elk Lake areas remain threatened, as well as state and federal infrastructure (Highway 95) and natural resources. Closures: Smokey Boulder Road to Railroad Saddle is closed. Additionally, the Nez Perce-Clearwater and Payette National Forests have area closures in effect, including portions of the Hells Canyon National Recreation Area (NRA); see https://bit.ly/2ATSand, https://www.fs.usda.gov/payette or Inciweb for more details. https://www.facebook.com/Idaho-County-Sheriffs-Office-178393728844032/ (Idaho County). Both Idaho and Adams counties use AlertSense for emergency alerts. In Idaho County, call the Sheriff’s Department @ 208-983-1100 to enroll; in Adams County, visit https://bit.ly/2AU0C5R to enroll. Temporary Flight Restrictions: Temporary flight restrictions (TFR) are in effect around the entire fire area. Remember, that temporary flight restrictions also apply to unmanned aircraft systems (drones), so if you fly, we can’t! Announcements: Stage 1 Fire Restrictions are in effect; use the following link for specific restriction information https://bit.ly/2ag2SUy. For public and firefighter safety, please adhere to all safety signage and speed reductions. Do not stop along the highway corridor near the fire. For road conditions and closures http://511.idaho.gov/.